Over the past three years, the monsoon – the rainy season that runs from June through September, depending on the region – has been weak or delayed across much of India, causing widespread water shortages. With the onset of summer this year, southern India, particularly Karnataka, Kerala and Tamil Nadu states, are already wilting under a blistering sun and repeated heatwaves. Drought is expected to affect at least eight states in 2017, which is a devastating possibility in a country where agriculture accounted for 17.5% of GDP in 2015 and provides the livelihood for nearly half the population. Across rural India, water bodies, including man-made lakes and reservoirs, are fast disappearing after decades of neglect and pollution. 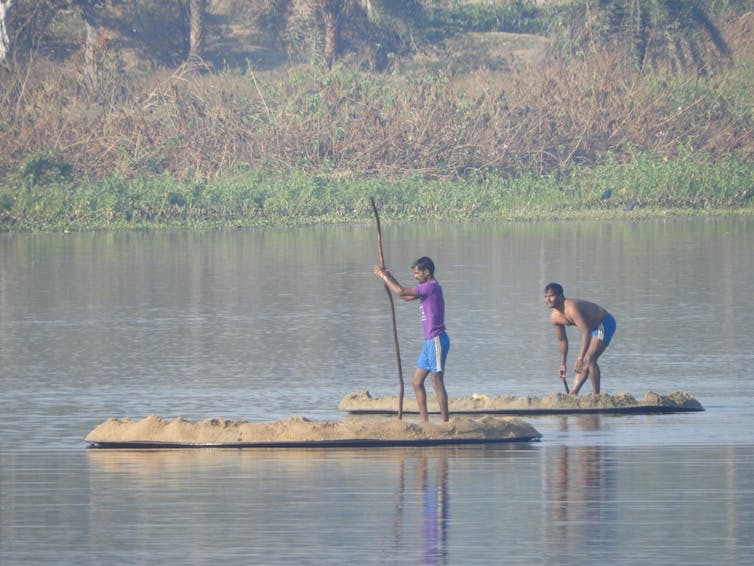 “They have drained out the water and converted the land into a plot for schools, dispensaries, and other construction activities,” Manoj Misra of the NGO Yamuna Jiye Abhiyan warned in The Hindu newspaper as far back as 2012. It wasn’t always this way. For the past 2,500 years, India has managed its water needs by increasing supply. 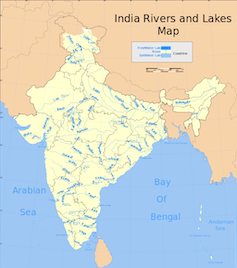 Prior to industrialisation and the accompanying global “green revolution” in the 1960s, which saw the development of high-yield variety crops using new technologies, India’s water availability was plentiful. Households, industries and farmers freely extracted groundwater and dumped untreated waste into waterways without a second thought. But such practices are now increasingly untenable in this rapidly growing country. Per capita availability of water has been steadily falling for over a decade, dropping from 1,816 cubic metres per person in 2001 to 1,545 cubic metres in 2011. The decline is projected to deepen in coming years as the population grows. India, which currently has 1.3 billion people, is set to overtake China by 2022 and reach 1.7 billion in 2050. Water scarcity is also exacerbated by a growth in water-intensive industries, such as thermal power production, extraction and mining, as India seeks to feed and power its growing population. In addition to affecting biodiversity, these activities also alter natural water systems. Still, successive governments have pursued the same old supply-centric policies, paying little heed to the country’s waning clean water supplies. For nearly 50 years, a misguided groundwater policy has sucked India dry; water tables have declined by an average of one metre every three years in some parts of the Indus basin, turning it into the second most over-stressed aquifer in the world, according to NASA. Across nearly the whole country, basic sewage management is also lacking. According to the Third World Centre for Water Management, only about 10% of waste water in the country is collected and properly treated. As a result, all water bodies in and around urban centres are seriously polluted. Today, the country is struggling to provide safe drinking water to every citizen. Even so, residents of New Delhi or Kolkata today use more than twice as much water, on average, than people in Singapore, Leipzig, Barcelona or Zaragoza, according to data compiled by the Third World Research Centre. The water use in Delhi is 220 litres per capita per day (lpcd), while some European cities boast figures of 95 to 120 lpcd. Excess consumption is attributable in part to citizen indifference about conserving water after so many years of plentiful supply. Since large swaths of many Indian megacities lack piped supply of clean water, leaks and theft are common. Cities in India lose 40% to 50% due to leakages and non-authorised connections. At this point, the only viable option for India would seem to be managing demand and using water more efficiently. The country is making tentative steps in that direction. The 2016 new National Water Framework, passed emphasises the need for conservation and more efficient water use. But under India’s Constitution, states are responsible for managing water, so central policies have little resonance. Neither the 1987 and 2012 National Water Policy documents, which contained similar recommendations to the 2016 policy, had any real impact on water use. And after millennia of exclusive focus on expanding the water supply, the idea of curbing water consumption and increase reuse remains a mostly alien concept in India. Consistent supply-centric thinking has also resulted in competition for water as states negotiate the allocation of river water based on local needs. The century-long conflict over the Cauvery River, for example, involves Andhra Pradesh, Tamil Nadu, Karnataka – three major south Indian states. With each state demanding ever more water, the river simply cannot keep up. In Karnataka, where agricultural policies are heavily skewed towards water-guzzling commercial crops, such as sugarcane, mismanaged ground and surface water are dying a slow death. Still the state continues to petition the Cauvery Water Dispute Tribunal for an increase in its share. Water scarcity in Karnataka is aggravated by non-existent water quality management. Its rivers are choked with toxic pollutants, and oil-suffused lakes in Bengaluru, the capital, are reportedly catching fire. Meanwhile, in the northern part of the country, the Ravi-Beas River is causing conflict between Punjab and Haryana states. In India’s water wars, rivers are a resource to be harnessed and extracted for each riparian party’s maximum benefit. Very little emphasis has been placed on conserving and protecting existing water sources. And not one inter-state negotiation has prioritised pollution abatement or demand management. Even policies from the national government, which claims to target water conservation and demand management, remain reliant on supply-side solutions. Big infrastructure programs, such as the Indian river-linking plan, envision large-scale water transfer from one river basin to another, again seeking to augment supply rather than conserve water and reduce consumption. For inspiration on managing demand, India could look to Berlin in Germany, Singapore and California, all of which have designed and implemented such policies in recent years. Successful measures include raising public awareness, recycling water, fixing leaks, preventing theft and implementing conservation measures such as water harvesting and stormwater management. Between rapidly disappearing fresh water, unchecked pollution and so many thirsty citizens, India is facing an impending water crisis unlike anything prior generations have seen. If the nation does not begin aggressively conserving water, the faucets will run soon dry. There is simply no more supply to misuse.